Home / Romantic NJ / Romantic Hotels in NJ – Our Top 27 Picks For The Best Lodging For Couples in NJ! Romantic Hotels in NJ – Our Top 27 Picks For The Best Lodging For Couples in NJ! If you’re a luxury lodger, finding new and unique hotels in your own state can be tough. From sprawling suites with every accommodation possible to relaxing spa services, here are our top picks for unique romantic hotels for couples in NJ by county! Atlantic County is a perfect place for a romantic stay in NJ. The most popular hotels are the string of casinos on the Atlantic City boardwalk, an area full of history and change. However, it is the quaint beach towns that provide a romantic solace from the busy life of everyday routine. Looking to take a dip? The Inn of the Dove in Little Egg Harbor is a romantic hotel for those looking to spend most of your time in the room. Packages include a suite with a jacuzzi, mirrors, and a separate room with a private pool so you and your loved one can take a secluded swim. Rooms come with their own private entrances – you’ll feel like you’re living in a paradise with just the two of you – oh, did we mention the private pool? Those looking for a more outdoorsy feel can stay at the Renault Winery Resort located in the nearby Egg Harbor City. Shop, dine, take a tour or enjoy a tasting hand in hand with your significant other. This romantic winery in NJ doubles as a hotel so nobody has to worry about driving home. With an on-site restaurant and golf course as well as off-site romantic horseback riding and 5K run/walk trail, spending a romantic weekend here will feel like just one night! Those in Northern NJ don’t have to travel far for a romantic hotel to stay in. Don’t leave home for too long with these uber-romantic Bergen County hotels for couples! Couples who want to be pampered won’t have to lift a finger when they decide to stay with the Hilton Woodcliff Lake. Not just your ordinary Hilton, this hotel provides top-notch service to make you feel like you’re at a resort on a warm Caribbean island. An indoor pool, sauna, fitness center, and outdoor pool make this a great all-around hotel to spend quality time with your favorite person in the whole world. The Hilton Woodcliff Lake is a four-star hotel that provides the best service in Northern NJ and it’s right in your backyard! Couples may not always be searching for a luxury getaway. The Lily Inn in Burlington County is a perfect location for couples who want a relaxed stay at a smaller hotel. 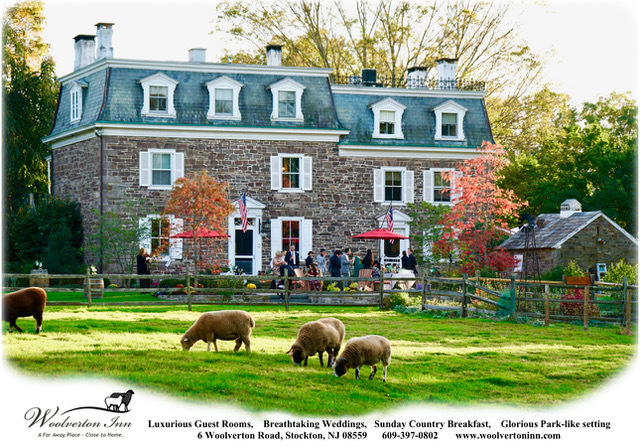 In fact, this B&B is excellent for those who want to stay around the Greater Philadelphia Area. There’s no doubt about it – the quaint rooms give an air of romance right on the banks of Delaware. Camden County may be just outside of the big city of brotherly love, but it is a place all on its own. Fall in love with the Lambertville House, a sweet spot for couples to spend some time together. This clean and pristine hotel has all the accommodations to curl up or go out on the town. Those who may want to take a trendy take on romance in New Jersey will love the Aloft Mount Laurel. With a Re-Charge Splash and Indoor Pool, a bar with live music, and a relaxing spa, you and your significant other can feel entranced and socialize with others. Be a part of the scene or exclusively enjoy each other’s company with this Camden County staple. One of the most popular destinations for romance is in Cape May, New Jersey. Couples can choose from a variety of lodging, from inns, motels, b&bs, and large hotels! Most notable for partners in crime looking to stay somewhere they can have an evening or two of escape is The Grand Hotel. Right on the water, it’s an obvious choice for romance right in Cape May County. Luxury awaits as an indoor heated pool and jacuzzi as well as an outdoor rum bar await you. A true romantic paradise on the Southern NJ shore! Head down to the south part of New Jersey and walk right into the hotels and motels of Cumberland County. Wingate by Wyndham Vineland is a getaway lodging area for romance just minuted from the Delaware River. Enjoy some adventure by the river during the day, then head back to this comfortable spot filled with amenities such as a fitness center, room service, and late checkout for those who might experience a longer night. If you and your partner are looking for a more populous and metropolitan area in NJ, Essex County is the best destination for a luxury hotel glistening with romance. 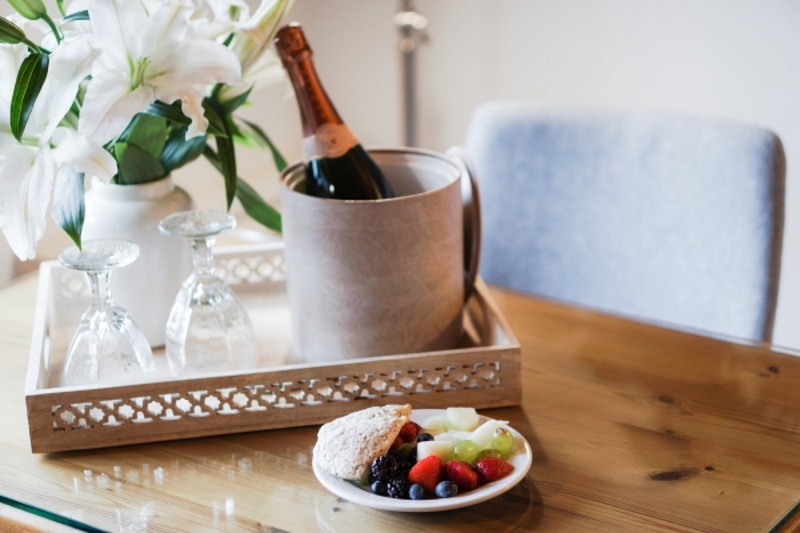 Home to Newark and West Orange, two of the most popular cities in the state, there are plenty options for lodging for a romantic atmosphere in the beautiful city without ever having to cross the Hudson River. The minute you and your partner set foot in the most populous city in NJ, you can enter right into your hotel. The Hilton Newark Penn Station includes amenities perfect for a small overnight getaway in Essex County. With the nearby Prudential Center as a backdrop for shows and entertainment, delicious eats just around the corner, and a bar tucked right in the hotel, enjoy a night of romance with your favorite person in the world. Looking to bring your furry friend along for your romantic stay in NJ? The Wilshire Grand Hotel is a pet-friendly, four-star hotel in West Orange that provides accommodations for dogs, a sweet shop, and a fitness center! For an even better modern twist on romance, Hudson County offers a New York style that other New Jersey hotels can’t grasp. For a trendy stay right on the Hudson River, The Holland Hotel will create a night or two of love for you and your partner. Their beautiful rooms and glass-enclosed shower/baths are just the tip of the romantic iceberg. Over in Jersey City, The Westin provides perfect amenities to make your romantic night in this hotel as comfortable as possible. There’s a gym, whirlpool/hot tub, an indoor pool, and a bilingual staff! Hunterdon County consists of tons of fresh farms and wineries to explore for a romantic weekend. The National Hotel in Turnersville offers unique roooms for a stay that will provide a quick escape on the countryside for you and your sweetheart. Their whirlpool tubs make it a romantic and secluded destination for couples. Couples who want to experience the life of an ivy leaguer can take a trip to Mercer County, where romantic destinations such as Princeton or experience the metropolitan areas of Trenton for a fast-paced, different kind of relaxing stay. The Peacock Inn offers a Jacuzzi Suite where you and your s.o. can relax in robes or take a dip in your own private hot tub! The Mounts Motel also provides a fun place to hang out hand in hand – just ask for the romantic king size room. Middlesex County is home to popular areas such as New Brunswick and Edison, epicentres for diversity, culture, and of course – romance. New Brunswick is located right over the bank of the Raritan River, making it a scenic spot when you make your reservation at the Heldrich Hotel, a luxury spot that even has room for your canine friend! Edison makes a great spot for delicious dining of every cuisine – you can stay in one place when you book your stay at Crowne Plaza in Edison. With a four-star steakhouse and special needs accommodations, this hotel makes it their mission to give you the best experience possible. If you go a little bit further and want a “Jersey Shore” experience, Monmouth County is where you want to be. Home to over 20 parks, 2 malls, and of course miles of beach, staying here is a decision as easy as a beach breeze. The Ocean Place Resort and Spa offers a romantic paradise right on the shore. From a tiki bar, a beach backyard, and a spa, spend a night or two here with your partner and you’re guaranteed to come out feeling refreshed. 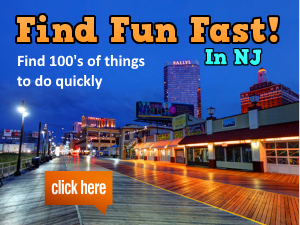 Drive a little north and you’ll hit Asbury Park, rated the coolest town in America! The Asbury Hotel is a newly rennovated place to stay for a romantic and fast-paced spot in NJ. With movies and a bar on the rooftop during the summer, a pool, and tons of things to do in walking distance (beach day, anyone?) you can fall in love with Asbury Park together. Morris County in northern New Jersey has no shortage of beauty in its hotels and surrounding recreational areas. Grab your boyfriend, girlfriend, husband, or wife and head over to The Neighbor House Bed and Breakfast. This sweet B&B is tucked right in the countryside for a quiet stay in the top part of the state. The Madison Hotel offers a way for the two of you to “stay in style” with the award-winning Rod’s Steakhouse and Grille, bar, spa, and pool, this is more than just your typical inn. Ocean County is home to beaches, boardwalks, breweries, and bed and breakfasts. This is a location perfect for a beachfront getaway or vacation. Pay to stay at these hotels and escape to a life of love and luxury at the Jersey Shore. Point Pleasant Manor is one block from the beach and offers breakfast poolside so you and your partner don’t have to lift a finger. The ultimate beach resort experience is at Drifting Sands in Ship Bottom (by LBI!) for oceanfront beach access and wheelchair accomodations for everyone to enjoy a hand-in-hand ocean-side hotel getaway. Passaic County is home to some of the most beautiful nature NJ has to offer. Stay at the Hanover Mariott and soak in their ameneties such as a beauty shop, fitness center, and more. A great getaway that’s closer than you ever imagined. Down in southern NJ lies Salem County, a part of NJ that is full of tradition, heart, and a lot of farmland. If you and your partner feel you need to stay somewhere surrounded by the best beauty the garden state has to offer, this is the place for you. Stroll hand in hand through you need antique shops and then stay at Barrett’s Plantation House, a quaint bed and breakfast that shows the personality that is Salem County. If you looked at the center of New Jersey, Somerset County would be where you’d land. Full of a unique combination of farms and modern flair, this county offers a place to stay for any couple looking for a place to relax or adventure. The Bridgewater Mariott offers the best of both parts of NJ – it’s right by the mall, so you can shop until you drop together or dine out at their many restaurants, while the indoor pool is a perfect laid-back activity for those who want to take it easy. To the north of the state is Sussex County, a rural yet sophisticated area that will make you feel like you’re in the mountains of Vermont. Perfect for the fall and spring seasons, Minerals Hotel is a part of Crystal Spring Resort and is a great seasonal destination for romance. Crunch through the leaves of the northern NJ mountains as you take a getaway you’ll remember forever. Couples who seek activity will love their Adventure Center, while those who want to relax can enjoy their deluxe elements spa. Union County houses perfect relaxing stays for those visiting New Jersey together. Just out of reach of Newark Airport, Crowne Plaza in Elizabeth is a comfortable place for couples to spend a night or two at. Gaze at low-flying airplanes out the window of your room that features a fitness center and rooms for those with disabilities. 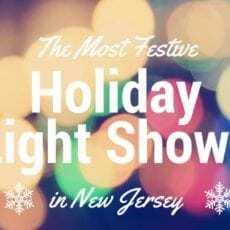 Want to stay in NJ but feel like you’re in another state? Warren County allows couples to experience a different type of New Jersey full of hipster towns and woodland resorts. Grab a bite at The Bistro Restaurant and kick back in The Courtyard Mariott of Lebanon NJ, the best hotel in Warren County! Check out our Ultimate Guide to Romance, with all the places in NJ for date ideas, getaways, day trips, and more! See our original list of date ideas in New Jersey. Where is the most romantic place you’ve stayed in New Jersey? What unique amenities did it offer? Comment below, we’d love to hear from you!